This week we are going to share with you the best beaches in Victoria BC in 10 minutes. We kept our choices within Victoria starting from Ogden point and we only went as far as Cadboro Bay. We chose both sandy and rocky beaches. Victoria is an island so we actually have A LOT of beaches, which is why we were also able to include an incredible feature in this vlog, which is how to find your own secret, private and secluded beaches. Starting at Ogden Point with Dallas Beach, this is our go-to choice when it gets super hot in Victoria (which is not that often). Think of it as air conditioning on a hot day. Nobody who lives close to the water has air conditioning, so when it gets hot, we can take a walk on Dallas beach and walk out on the breakwater and cool off. Our second choice is our ¨home base¨ beach, Spiral Beach. This is at the bottom of Cook Street by Ogden Point. This is a pebble beach, great for throwing stones and taking a break in our work day as it is only a short walk or bike ride from our home. We added a bonus beach for you, Ross Beach. This one is a favourite for photoshoots. There is something about all the driftwood and the backdrop on this beach. It is probably our most often, go-to beach for an after dinner stroll. Next up is another favourite, Gonzales Beach. The sandy beach and the bay means that it is sheltered which also makes it a great place for sun tanning and swimming. 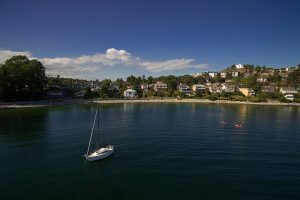 Probably the most popular Victoria BC beach is Willows Beach in Oak Bay. This beach is a family favourite for day trips, BBQs, picnics, and swimming. It is another great sandy beach to spend a hot summer´s day. Our final pick is Gyro beach in Cordova Bay. This is a great beach for paddle boarding and canoeing. Make sure you watch the video so you can be in know on how to find all the secret and secluded beaches in Victoria BC. We will be giving you all the tips.